I’ve included references to East Liberty—a neighborhood in Pittsburgh’s East End—in pieces I’ve written for VSB, Ebony, Slate and GQ, and it’s peppered throughout my book. There’s an entire chapter, for instance, devoted to the changes it’s undergone in the past 20 years. I do this because it’s where I spent many of my formative years. My parents moved to East Liberty when I was 9, and we lived there until I was 16. When I’m asked where in Pittsburgh I’m from, East Lib is the answer. Also, East Liberty is the nexus of a massive redevelopment and gentrification campaign occurring in the city now. What’s happening there is what’s happening in some parts of Brooklyn and Harlem in New York City and Washington, D.C., and other places. As people who’ve lived in areas where this is happening can tell you, the changes—cultural, economic and sometimes even topographical—can be so stark and sudden that it causes some sort of racially tinged vertigo where, if you’re a black person from one of these neighborhoods, you see people who look like you displaced and replaced by people who don’t (and sometimes that person who looks like you is you). You see them jogging and walking their shih tzus down streets they wouldn’t have driven on 15 years ago. You see businesses you frequented replaced by those where, while you’re not told that you’re not allowed there (because that’s illegal), there are barriers, some invisible, some existential, some literal, erected and maintained to keep you out. To make you feel unwelcome. To communicate that this place that you once called home is no longer a place for you. Of course, these changes can also induce an ambivalence and a ceaseless cognitive dissonance in even the most radical black person. Because not all of the changes are bad. Some you may even appreciate. And not every new entity storms in with an incurious and insensitive mindset. Some are mindful of what happened and what’s currently happening to the community and genuinely wish to engage members of it. Sometimes this is done through targeted hiring. Sometimes this is done by just loudly communicating that we’re welcome. Still, you wish that perhaps these investments into the neighborhood could have happened without replacing the people. And then there are people like Eve Picker, who exemplify what we mean when we call white people colonizers. Since 2013, an art installation project called The Last Billboard has sat on a rooftop on the corner of Highland and Baum in East Liberty. Every month or so, a new artist is invited to create a message for it, which appears on the billboard’s 12-by-36-feet steel frame. 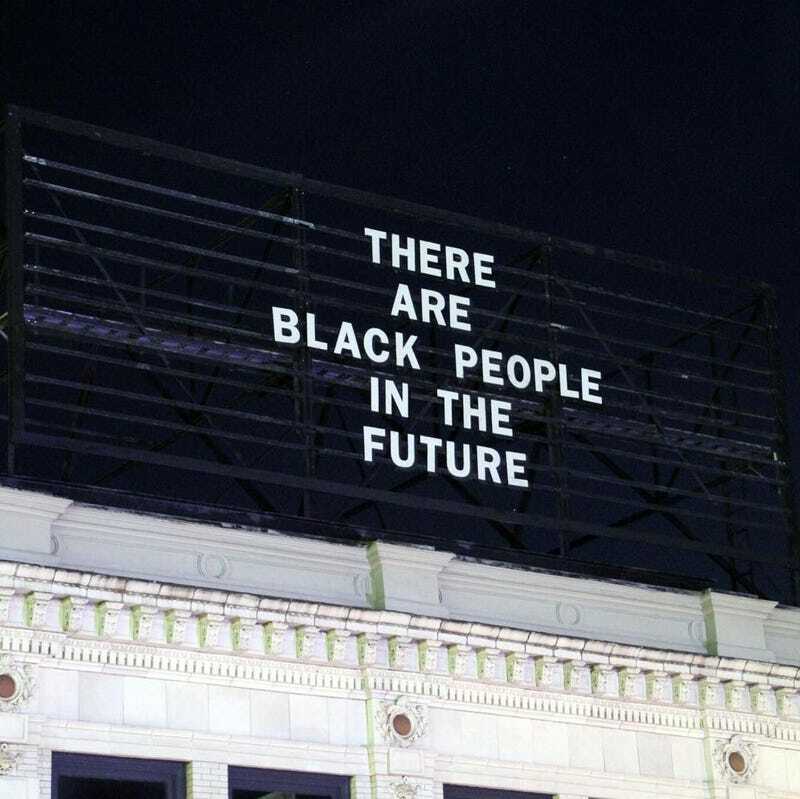 In March, interdisciplinary artist Alisha Wormsley curated the project, and her message read, “There Are Black People in the Future”—a communiqué with both broad racial and political undertones and very obvious commentary on what’s happening in East Liberty right now. It was not especially offensive—unless, of course, you are offended by the thought of a future with black people in it. Last week, however, the installation was removed. And according to Jon Rubin, the founder of the Last Billboard, he was pressed by the landlord of the building it sits on top of, which is owned by a Pittsburgh-area real estate company called We Do Property. Eve Picker is We Do Property’s CEO. Other colonizers complained to a chief colonizer, and she listened. She was offended by the sign and invented a justification for its removal. She builds those god-awful tiny houses, puts them in the hood and sells them for $100,000. She has an online real estate and crowdfunding portal—which I think is what the white people in Avatar were doing on Pandora—and the staff, well, look exactly how you’d expect them to. She’s a poison pill contract with sentience. She believes she’s a good person, but the only way for that to be true would be to change the definition of good. Of course, there are Eve Pickers in every urban space today, finding new ways to pioneer and invent spaces that already actually exist, finding new methods to conceal and perhaps even erase any trace of what was once there, finding new language to euphemize what they’re doing and finding new resources and favorable ordinances and grants and governments to assist them in this process. And they will not stop until there are no black people in their futures.